There is a new challenge called The Male Room which launched today in which everything has to be male orientated - it seems male projects are the ones which people struggle with so it will be great to see lots of inspiration from the design team and of course the people who join in. 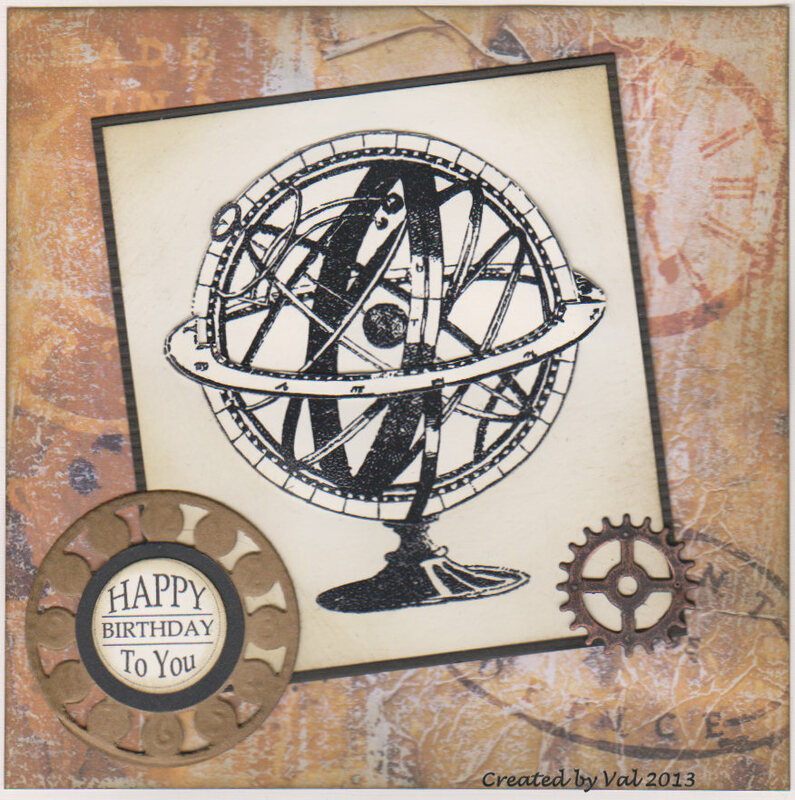 For the first one they've eased us in gently with an 'anything goes' theme and for my card I've used a free stamp from Docrafts (Papermania) which has been stamped three times, embossed and layered for dimension. I designed the background paper using various blend modes in Craft Artist so I didn't want to cover too much of it with lots of embellishments. I simply added a computer greeting with a couple of die cuts which I 'found' when tidying my work space. I really enjoyed making the backing paper and was prompted to do this because Michelle has been on Create and Craft this week with Craft Artist pick of the week and seeing her demonstrations always fires me up to use the programme more. It is a shame really that there has to be so much 'waffle' in these shows rather than 'wall to wall' demonstrations but sadly that's the nature of shopping channel shows - after all they are there to sell!! Hi Val - I was excited to hear that Jacqueline was launching this Men Only blog and I love your card. I agree about Michelle on C&C - she does some lovely stuff, it's just a shame we can't see her doing more of it!!! This is a great male card Val, I'm hoping to take part in this challenge, time and kitchen allowing. Splendid guy make - think I'll be enjoying these challenges as I'm one of the ones who struggles with male cards! Looks brilliant with the background & absolutely spot on for the male species. I saw this blog was going to launch - I shall keep an eye on it and try and have a go. Very effective card and love the background. Super card! I do like the background and that globe is fab! A fab male card Val. I love your background paper and the lovely colour tones you've used. 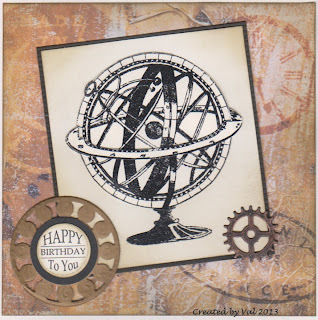 Great card, I love the background you made and the stamp is perfect for male cards.